These days, air travel can be quite frustrating. You stand in long lines to check in, clear security, and board the airplane, and then you sit for hours in cramped seats with only a bag of peanuts and perhaps a bad movie for solace. You’d love to be one of the elite few who waltz through shorter premium check-in and boarding lines and stretch out in first class with a free drink, but you can’t afford that kind of lifestyle. Or can you? Elite status is your ticket to shorter lines, better service, and free upgrades. But many leisure travelers never attain this level of air travel clout either because they don’t fly enough or they don’t know the tricks to getting status faster. Even if you don’t plan on flying upwards of 25,000 miles this year, you still have several ways to attain elite status. Keep reading to figure out which method is right for you. The usual way of attaining elite status is by flying…a lot. Each airline has its own elite qualification rules, but in general you must fly 25,000 elite-qualifying miles in one year to earn the lowest level of elite status, 50,000 miles to earn mid-tier status, and 75,000 to 100,000 miles to earn the highest level of elite status. Among the U.S. airlines, Frontier has one of the lowest qualification requirements; fly 15,000 miles per year to reach Ascent Level status or, for even more perks, fly 25,000 miles to reach Summit Level. However, elite-qualifying miles are not always the same as flight miles. You will get a bonus from several airlines for flying in first, business, or full-fare economy and earn 1.5 or two elite-qualifying miles per mile flown. On the opposite end of the spectrum, discount economy Continental tickets not purchased on the airline’s website will only earn 50 percent of miles flown toward elite status. If you pay more for your flights, you’ll earn status faster, but if you go for the cheapest fare, you might find your quest for elite status taking longer than you thought. In addition, many major airlines let you earn elite status based on qualifying points or segments. For example, if you fly 30 segments on American at 500 miles each, you’d be able to attain Gold elite status, even though you will have only earned 15,000 miles, which is 10,000 short of the requisite miles to gain status. For exact miles, points, or segments needed to become elite, check the website of your preferred airline or call its frequent flyer program customer service center. If you’ve read the requirements and know that there’s no way for you to fly enough miles in a year to reach the lowest level of elite status, take heart. A few airlines offer shortcuts to elite status, usually in the form of an elite challenge. You won’t find these offers on the airline’s websites; those in the know need to call their airline’s frequent flyer customer service center and inquire about details. So what is a challenge? Usually, an airline will require you to fly a certain number of miles or take a certain number of flights in a limited period of time. If you meet all the requirements, you will receive automatic elite status. American’s program is ongoing and the best-defined elite challenge in the industry. Within a three-month period, you need to earn 5,000 points to attain Gold status or 10,000 points to earn Platinum status. You will receive a half point for each mile flown on a deeply discounted economy fare, one point for regular economy, and 1.5 points for full-fare economy, business, or first class. Challenges like this are excellent for travelers planning back-to-back cross-country or international trips because you can get status with only a few flights. Other airlines are more ambiguous about challenges, but it can never hurt to call. Being a loyal customer with a history of accruing frequent flyer miles helps. For instance, I called US Airways to inquire about a challenge, and the representative told me that based on my empty mileage account, they could not offer me a challenge. However, when my coworker—who is a frequent US Airways traveler with over 35,000 miles in her account—called, she was told that a challenge would likely be available beginning March 1, in which she would have three months to fly 10,000 miles or 12 segments. Also, most airlines won’t let you do a challenge every year, so the opportunity could be once in a lifetime. Before you sign up, make sure that you have a very good shot at succeeding in your efforts to attain status and that you’ll be flying enough in the coming year to benefit from that status. Otherwise, you will have wasted your fleeting elite standing. If you’ve got elite status on one airline, you may have a chance to get similar status on another carrier without flying a single mile. Airlines are always eager to pilfer elite members from other carriers, mostly because elite flyers by nature spend a lot of money on frequent flights and upper-class travel. Therefore, the airlines are willing to extend status in their program for free to elite travelers planning to switch their loyalty. However, complimentary status is often a once-in-a-lifetime perk, so think twice before you ask for it. To find out about comps, call the frequent flyer customer service center of the airline on which you want to get status. Most likely, you will be asked to submit a copy of your current carrier’s frequent flyer statement, proving your elite status. You might also need to explain why you want to switch your loyalty or outline your upcoming travel plans on the new airline. Status is never guaranteed through a comp attempt, but being a very frequent flyer increases your chances. Also, some airlines have a policy of not stealing members from their partners; for instance, Continental will comp status to American’s members but not to partner Delta’s. While this policy of comping status is mostly hush-hush, some airlines make it a point to reach out to elite members of other programs with public promotions. For instance, Frontier’s Quick Ascent offer promises its lowest-tier Ascent Level status to travelers who submit a statement showing elite status on another carrier as well as their Frontier EarlyReturns number. Don’t forget to look for the occasional elite promotion on your airline’s websites or through the marketing e-mails you receive. Sometimes the airlines offer public challenges or other offers geared to getting you elite status faster. At this writing, United is offering prepaid cards for $5,000 to $20,000 that grant automatic elite status. The cards work like gift cards for the purchase of flights, and even give a discount for air travel purchased online. In addition, United is offering extra elite-qualifying miles for airline tickets purchased with a Mileage Plus Visa this year. 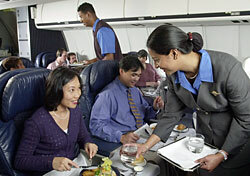 And in the past, airlines such as America West have offered fast-track promotions to elite status on their websites. So if you really want to attain status, keep an eye out for promotions that will aid you in your quest. These perks can make your reservations, airport, and in-flight experiences more comfortable and stress-free. However, if you’re going to make the effort to go for elite status, be sure you’re going to take at least a few flights after your qualifying ones. You can’t reap the rewards of status without heading for the airport.